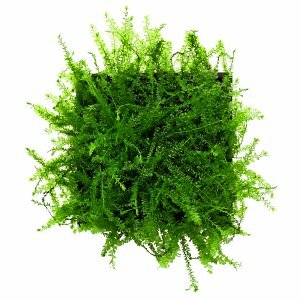 Mosses are quite easy to cultivate, and they don't take long to give the aquarium or the aquascape a rustic look and a feeling of natural wood- or marshland. More and more moss species have been introduced into the planted tank hobby, and now we have a great number of different mosses to draw upon. Many moss species attach themselves to rocks and driftwood, and thus give the hardscape a very beautiful natural appearance. Fissidens fontanus is especially popular with aquascapers and planted tank keepers. The smaller mini Fissidens species are significantly more difficult to cultivate and grow much more slowly than Fissidens fontanus. Riccardia sp., also called coral moss, is another very attractive moss that attaches itself to rocks or driftwood. Many species of the genus Taxiphyllum like classical Taxiphyllum barberi (Java moss) or of the genus Vesicularia, e.g. 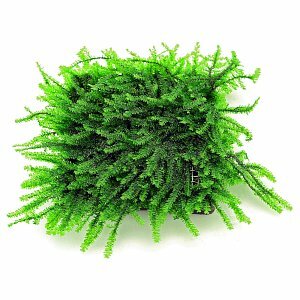 Vesicularia "Christmas Moss", look like mosses you would find in a forest, and they can add a very natural feeling to an aquarium that is hard to achieve with other aquarium plants. 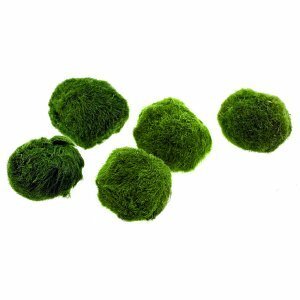 Mosses offer aquascapers and aquarium keepers in general a great number of uses, and for this reason they are very popular. Pilotrichaceae sp. 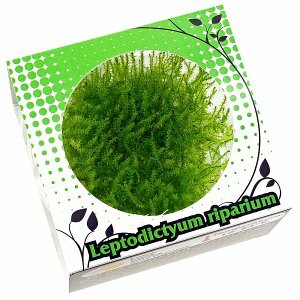 - "Pilo moss"
The variety of aquarium mosses has grown enormously since the 2000s. Not long ago only a few species such as "Javamoos" (both Taxiphyllum barbieri and Vesicularia dubyana) and the floating crystalwort Riccia fluitans were common in aquaristics. Especially hobbyists in East and Southeast Asia have developed a great interest in new mosses for aquariums, so it is no coincidence that many of these species are native to Asia. The popularity of mosses in aquariums also goes hand in hand with new design styles in aquascaping, the boom in freshwater shrimp keeping- and breeding and the popularity of nano aquaristics. 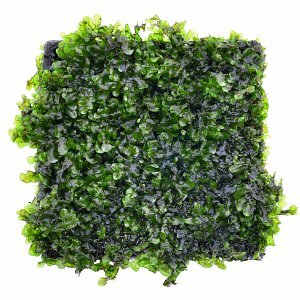 A number of newer moss types are now produced by the large aquatic plant nurseries and in vitro laboratories. However, many mosses can only be bought online, or they are bartered among aquarists. In our shop we offer a wide range of aquarium mosses, some from our own cultivation. 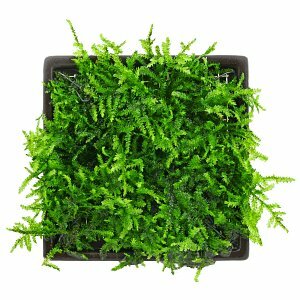 These include rarities such as the "Pilo-Moss", which have been little known up to now and which, in our experience, are ideally suited for aquarium design. 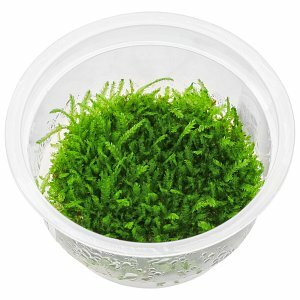 In vitro culture offers the opportunity to get moss that is guaranteed to be free of algae and pests. Mosses conjure up a very special, natural atmosphere in aquariums. They are primarily epiphytic plants, meant for decorative materials such as stones and root wood (the hardscape). The creation of a moss carpet, growing on the substrate of the aquarium is also possible. Aquarium mosses with their different green tones, textures and growth forms offer many attractive possibilities for aquascaping. Even floating plants such as Riccia and Ricciocarpos natans are found among the mosses. 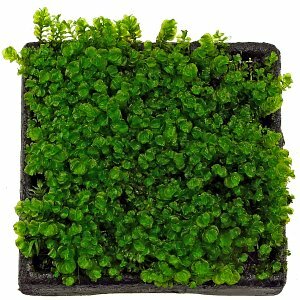 In general they are rather slow-growing plants, but there are also fast-growing mosses like Riccia fluitans or Drepanocladus aduncus. Last but not least, aquarium mosses contribute to a biologically well-functioning aquarium. They offer a large settlement area for useful microorganisms and are often grazed by shrimps, which also keep algae growth in check. Mosses are also gladly used by serveral fish species as spawning grounds and provide cover for young fish, and also some food in the form of microfauna, which settles in the moss thicket. The aquarium mosses belong to two very different groups of relatives: on the one hand the "real mosses", the so-called deciduous mosses. They are divided into stems and leaves. On the other hand, there are the liverworts, a diverse group with forms such as the crystalwort (Riccia fluitans), the tender Monosolenium tenerum and Riccardia species, but also leaf moss-like plants such as Solenostoma tetragonum and Plagiochila integerrima. Curiosities are the "Wave moss" and the "freshwater kelp", which resemble liver moss but are not actually related to it. They are fern gametophyte (prothallias), a fern youth stage. In aquaristics, however, they are comparable in handling to mosses and are therefore also available in our online shop under the category "mosses". Also the "moss ball" Aegagropila linnaei is listed under "mosses", but is actually a very slow-growing species of green algae. Many aquarium moss species are usually only temporarily submersed when growing in their natural habitats; they sit on stones and wood on streams, in floodplains and swamps; nevertheless, they thrive in the aquarium even when being constantly submersed. Such mosses are suitable for a dry start, but also for the design of humid paludaria, riparia and Wabi-Kusa. Others are solely water mosses by nature, such as Fissidens fontanus, spring moss species (Fontinalis) and the "Queen moss". They are difficult or impossible to keep emersed. Most aquarium mosses come from the warmer regions of the earth and thrive well at the usual room aquarium temperatures of > 20 °C. Others such as spring moss (Fontinalis) and streamside moss (Leptodictyum riparium) are native to Central Europe and ideal for cold water tanks. With sufficient CO2- and nutrient supply, they'll thrive in temperatured tanks as well and up to a temperature of up to 25 °C. Mosses are considered to be quite modest in their need for light, and some species like Taxiphyllum barbieri are very undemanding. Experience shows, however, that most species only show their best side with good lighting, CO2 addition and a full-spectrum macro- and micronutrient fertilization, bringing out the densest branching and the deepest green tones. The planting of hardscape with mosses is described in this Wiki article. Many mosses are able to attach themselves to the substrate by forming so-called rhizoids, root-like adhesive organs that look like brown or colourless hair of sorts. In order to grow firmly onto the surface, the developing shoot tips must come into permanent contact with the substrate. Some moss species grow only slowly or not at all under water. They occasionally need to be reattached before they come loose completely and float to the surface.